I was warned yesterday about the conditions; “PV was blown out all over the place,” was the report. 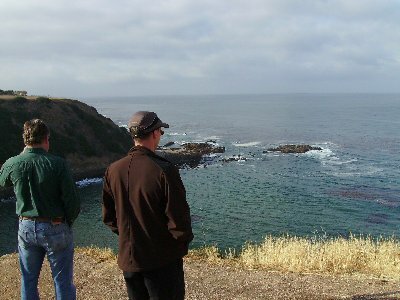 Old Marineland access, or I should now say “Terranea Resort” beach access, is still closed, so I showed up at Honeymoon Cove where Reverend Al and Not So New Chris were already scoping the conditions out. It was extremely low tide with some waves coming into the rocks. ..we found similar conditions; not so much waves, but very green water. “It looks way better than it did yesterday,” Chris said. I inquired about Malaga Cove. “I just came from there – forget it, it’s mud,” Chris said. Not a good day for diving and not even a good day for surfing; everyone got skunked today. Looks like your theory about Marineland may come true. I get the feeling that it won’t open until June when it opens for the general public. 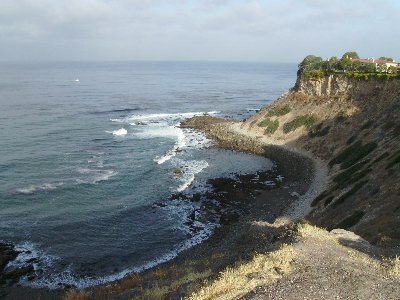 Frank and I are diving Casino Point this Tuesday for the first time, conditions in Catalina are looking sweet.